Thanks to a study with monkeys, the idea of using stem cells to accomplish heart repair on a clinical scale seems more realistic. Stem cells have shown promise in small-animal models, that is, in mice and rats. Still, it was unclear whether human embryonic-stem-cell-derived cardiomyocytes (hESC-CMs) could be produced in adequate numbers, and cryopreserved with sufficient viability, to even approach human application. In a step up from small-animal models, scientists at the University of Washington used a monkey model of myocardial infarction to test how well hESC-CMs could replace damaged tissue with new heart cells and restore failing hearts to normal function. The scientists injected 1 billion heart muscle cells derived from hESC-CMs into the infarcted muscle of pigtail macaques (Macaca nemestrina). This was 10 times more of these types of cells than researchers have ever been able to generate before. The researchers found that over subsequent weeks, the stem-cell derived heart muscle cells infiltrated into the damaged heart tissue, then matured, assembled into muscle fibers, and began to beat in synchrony with the macaque heart cells. After three months, the cells appeared to have fully integrated into the macaque heart muscle. 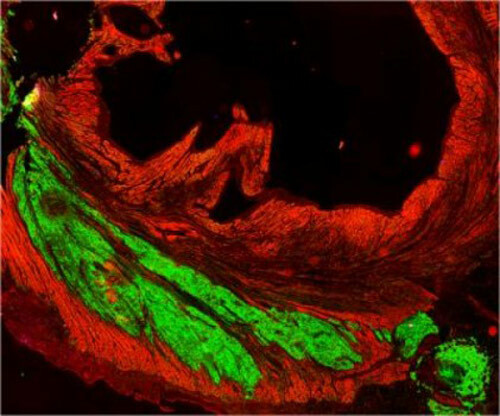 “Before this study, it was not known if it is possible to produce sufficient numbers of these cells and successfully use them to remuscularize damaged hearts in a large animal whose heart size and physiology is similar to that of the human heart,” said Charles Murry, M.D., Ph.D., professor of pathology and bioengineering, who led the research team that conducted the experiment. The research team published its results April 30 in Nature, in an article entitled “Human embryonic-stem-cell-derived cardiomyocytes regenerate non-human primate hearts.” In this article, the authors indicated that their work demonstrated that hESCs can be grown, differentiated into cardiomyocytes, and cryopreserved at a scale sufficient to treat a large-animal model of myocardial infarction. On average, the transplanted stem cells regenerated 40% of the damaged heart tissue. Ultrasound studies of the macaques’ hearts showed that the ejection fraction, an indication of the hearts ability to pump blood, improved in some of the treated animals but not all. The researchers also found that arteries and veins from the macaques’ hearts grew into the new heart tissue, the first time it has been shown that blood vessels from a host animal will grow into and nurture a large stem-cell derived graft of this type. The most concerning complications were arrhythmias that occurred in the weeks after the macaques received the stem cell injections, Dr. Murry said. None of the macaques, however, appeared to have symptoms during these episodes, which disappeared after two to three weeks as the stem cells matured and became more electrically stable. The researchers also cautioned that in their macaque model, the infarcts they had induced were smaller than the clinically severe infarcts that might benefit most from hESC-CM therapy. The researchers added that larger infarcts, in human hearts, might manifest more arrhythmias. Going forward the researchers will work to reduce the risk of arrhythmias, perhaps by using more electrically mature stem cells. They also will try to demonstrate definitively that the stem cells are actually strengthening the heart’s pumping power.